An energy audit could be the only thing between you, a safe home, and a full wallet. Canadian buildings, according to the Canada Green Building Council, consume up to 38 per cent of all secondary energy use, which is energy obtained from primary energy sources. Residing in your home, you consume energy in many ways: cooking dinner on the stovetop; running water for your bath; refrigerating your leftovers; and, of course, heating your home. You might turn the lights out before bed and take care not to waste water. Though this effort certainly helps conserve energy, consider the possibility of problems in your home that are nearly impossible to detect yourself; difficult to control; and ones that are ultimately preventing you from achieving an energy-efficient home. Consuming energy is inevitable and, in fact, necessary. However, we can be smarter about the ways in which we do so and we can make our homes more energy-efficient, which in turn will ensure they are safe and sound, warm and dry, and even help patch up that hole in your wallet. First, you need to find out how your home is using energy. Taking a look around on the inside or outside of your property, you might spot the source of a leak or draft. In many cases though, the issue is more subtle and out of sight. The only completely reliable way to find out how your home is using (or losing) energy is by having a certified and experienced inspector visit and carry out a thorough energy audit. An energy audit using infrared imaging is both an accurate and completely safe way to detect whereabouts you’re losing energy. However, an infrared inspection can be complex and is most reliable when a thermal imaging expert conducts the energy audit—surveying your home’s whole envelope and indoor environment—and properly interprets the results. This way, you’ll save time and, ultimately, money. A certified infrared inspector, using a high-resolution infrared camera, is able to detect any problem that may be preventing your home from maximising energy. The camera picks up the energy flow inside the house, reading where and how it’s being used. The inspector weighs the energy input against the output and is then able to tell the energy conservation of the home. Depending on his or her results, the inspector will inform you of the ways you can improve energy efficiency, through repairs, renovations, upgrades or other lifestyle modifications. A sustainable energy environment, or green building, can be achieved, regardless of whether you’re in the building process or you’ve been living in your home for decades. An energy audit may not be in your budget. However, if your home has heat escaping or isn’t making the most of its energy, you should begin to assess the pros and cons at hand. A situation like this is not only costly itself, but it can be dangerous. Often, the problems detected during the inspection are ones that must be fixed immediately. For instance, moisture buildup jeopardizes the structural integrity of your home and can lead to black mold growth within 24 to 48 hours. When you own a home, you’ve committed yourself—your time, money and attention—to maintaining it. Be certain its energy consumption is neither costing you a fortune nor risking your comfort and safety. Article written by Ivan Ward, Inspector at Mold Busters– Infrared inspection services from Ottawa. I have decided that this year’s theme for building materials will be waste. Specifically, I will feature products made from waste material, products that produce little waste during manufacture, products that include recycled material and products that can be recycled at end of life. Of course, it goes without saying that first and foremost it has to be a functional and useful product. In that vein, one product from Alex Wilson’s top ten list of green building products, 2013 is semi rigid cork insulation produced by Amorim, a Portuguese company. Amorim also happens to be a partner of Jelinek Cork, a Canadian company who distributes this product in Canada. I’ve written about Jelinek Cork before and many of the products they produce. Cork is a fantastic building material. Not only is it a rapidly renewable material (the cork trees’ bark can be harvested every 9 years), it is highly resilient, a great sound dampener, a natural flame retarder and has a multitude of uses from floors to fabric to insulation. Semi-Rigid Cork Insulation also meets all the criteria I described in my waste theme this year. This semi-rigid insulation is made from cork granules that are a by-product, or waste product, from the process of wine bottle cork making. The granules are treated with steam which expands the cork. The steam also activates the cork’s natural binder, suberin, which binds the expanded granules together. No other binder, glue or adhesive is necessary. At end of life, these cork boards are biodegradable, meaning zero waste to landfill. 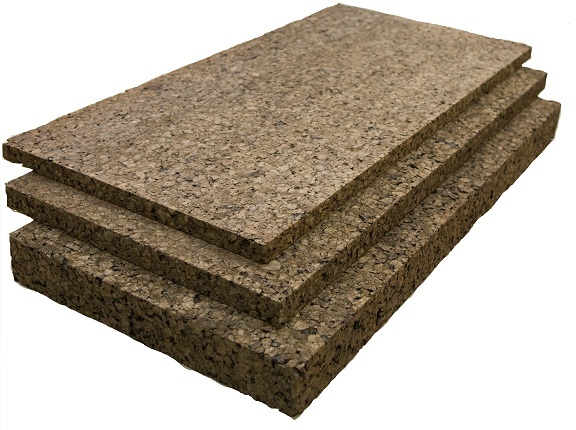 Semi rigid cork insulation has an R value of 3.6/inch. There is a variety of uses for this cork, although it was developed primarily as an insulation material. It can also be used as a bulletin board to cover an entire wall, or for recording studios and other areas where dampening sound is important. It comes in packages of 1’x3′ sheets in thicknesses ranging from 0.5″ – 4″. You can visit Jelinek’s website to find out more about Amorim semi rigid expanded cork board, as well as to buy it. A few weeks ago I sat down with the new owners of EcoInhabit, a wonderful green building business located in Meaford, ON. Tim and Jan Singbeil are passionate about green building and even more than just building energy efficient homes, they are passionate about building healthy, low energy-consuming homes. Our conversation lasted for over two fascinating hours, and by the time I left, not only was I a believer in Durisol, I was a believer in “healthy buildings” — which is about so much more than constructing energy efficient buildings — it’s about constructing buildings that take some of the toxic burden off our already too chemically-laden bodies. If you’re not familiar with Durisol Blocks, they are in the family of Insulated Concrete Forms (ICFs), however, ironically, ICF manufacturers don’t consider them a direct competitor — and truth be told, they’re not, because they do so much more than provide a sturdy, well-insulated building. An ICF built foundation has many advantages over a simple poured concrete or block concrete foundation. An ICF consists of a “brick”, like a concrete block, typically made out of styrofoam, and filled with concrete. The advantage of this building system is that it’s easy to assemble, it’s extremely sturdy, it uses less concrete than a traditional foundation, and includes insulation so no additional insulation is necessary. It’s also mould and pest resistant. Construction: similar to lego blocks, it means that there is no thermal bridging — heat can’t escape through the wood studs which happens in a traditional stick-built home. Buildings are solid and durable. Unlike polystyrene ICFs, which are insulated on the interior and exterior of the concrete, Durisol blocks are insulated with recycled mineral wool on the external side of the block only, allowing the other benefits of Durisol to work. Thermal mass: because insulation is on the exterior side of the building block, the concrete within the block is able to act as a significant thermal mass which means it can regulate heating, cooling and relative humidity within a building. In order to perform the way they were intended, Durisol works best without a vapor barrier between the finished walls and the blocks, which means that a breathable finishing coating such as American Clay or limestone are excellent complementary materials to use. There have been studies done showing the benefits of Durisol, but adding a vapor barrier prevents the walls from doing their job. The concrete won’t be able to act as a thermal mass the way it’s intended, and relative humidity won’t be regulated. Healthy air: Durisol blocks are made with benign materials so there is no off-gassing of any harmful toxins. Further, when built with a breathable wall finish, the structure acts as an extensive relative humidity regulator because of its hygroscopic qualities. For further information on the benefits of breathing walls, Durisol has developed this comprehensive report. Mould, pest and vermin resistance. Because these blocks are made with 20% cement, they are mould, pest and vermin resistant. Home air stays healthy. Termites aren’t an issue. Neither are hurricanes for that matter. These blocks are so sturdy when filled with concrete, they are “severe weather” proof. R-value. Durisol makes several different blocks, narrower ones with no insulation that are good for interior walls, and thicker ones with insulation for exterior walls. The smallest block with no insulation has an R-value of 8. The thermal blocks, that is, those containing recycled mineral wool insulation, range in R value between 14 and 28. Unlike a traditional stick-built home, there is no thermal bridging in Durisol homes. For more detailed information on the block’s thermal performance, read here. What about the concrete issue? So yes, concrete is used in the building of a Durisol-built home. However, because of the other positive properties of Durisol-built homes, and that the concrete industry is constantly working on lowering its carbon footprint, it can be considered a cost of building for the time-being. Whether or not building with concrete is sustainable, well, that’s a whole different question. The sustainability of a building method implies that it can be repeated infinitely without decreasing or degrading future populations’ needs. Oh, and if you’re wondering if this is some new-fangled green building material, the answer is no. Durisol has been around since 1953, so its buildings have a proven track-record. 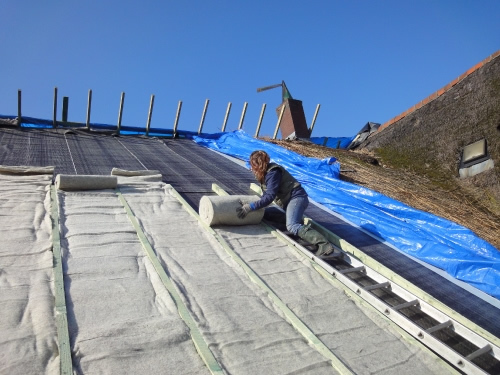 Tim and Jan have convinced me of Durisol’s “green” properties, provided the blocks are used they way they are meant, and not just for energy efficiency, but in the construction of a healthy home. Thanks so much for speaking with me Tim and Jan! For more information on Durisol, visit the website. For more information on Tim and Jan Singbeil’s company, visit EcoInhabit’s website. *In an earlier version of this article I explained that Durisol was not a DIY product and that specialists were needed to build properly with it. However, Tim emailed me to let me know that, in fact, Durisol is made for home installment and only on occasion is his building team called in to help with construction involving Durisol.